I can't be sure how this Montenegrin soup came to be named "Soul Soup," but I can guess. As with any dish - especially soup - that's slow-simmered over the course of several hours, the more time and heart that goes into it, the more the soul of the dish emerges. This soup is as hearty as it is healthy, and could easily be adapted to a vegetarian meal by omitting the pork. Ladled into big soup bowls, sprinkled with fresh parsley and topped with a healthy pinch of sea salt and freshly ground pepper, you will surely feel your soul fed and replenished as only a steaming bowl of soup can do. This recipe called for a rutabaga, which I had always (mistakenly) thought was a turnip. Turns out, they are quite different, although both belong to the mustard family. The turnip is an ancient vegetable dating back to Palaeolithic times, while the Rutabaga, a cross between a turnip and a cabbage was "invented" in the 18th century. The rutabaga tends to be a bit sweeter and starchier than the turnip, and turns from white to a lovely light orange color when cooked. Added to the soup, it imparts a surprisingly rich, sweet flavor. 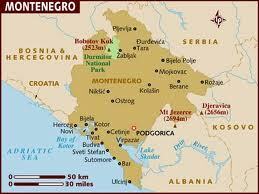 Located in southeastern Europe, Montenegro, meaning "black mountain" sits along the coast of the Adriatic Sea and borders Croatia, Bosnia and Herzegovina, Kosovo and Albania. The rich history of the country dates back to the 10th century. Cuisine in Montenegro is influenced by Italian traditions which is reflected in the country's methods of bread making, meat curing and drying, cheese making, wine, soup, stew techniques. Levant and Turkey also influence Montenegrin cooking and pastry making. Soak beans overnight for 8-9 hours. Put ham and beans in a large pot. Cover with about 2-inches of water, bring to a boil, then turn heat down low and simmer covered for on hour. In olive oil, saute onions, celery, green pepper and garlic until soft, then add to soup pot and simmer for another hour. Remove meat and shred with fork, then return to pot. Add carrots, rutabaga, zucchini and barley and simmer for another hour. Add parley at end and ladle into large bowls. Final Assessment: This recipe makes a large pot, and I'm almost certain that it'll be better tomorrow after the creamy barely has thickened up the broth. We lapped it up with a loaf of crusty bread and called it dinner! Sarah, your photography is getting more and more beautiful!